The 3 components of balance control that help keep you steady. How to know if each component is working properly the way it’s supposed to (these are simple tests you can do on your own without any expensive equipment. The 3rd test is what people usually fail the most). Simple techniques to strengthen all 3 components (we will do them together during the workshop, one of them you would have never thought would make such a big difference). For those who cannot make the date and time of the workshop, please click here. Dr. Arlan Alburo, PT, DPT, MTC founded Orthopedic and Balance Therapy Specialists (OBTS), a physical therapy practice, in 2003. Over 3500 patients later and 3 locations in Northwest Indiana in Valparaiso, Crown Point, and LaPorte, OBTS strives to liberate Hoosiers from relying on pain pills, getting them active and mobile without fear of slowing down, well into their retirement years. 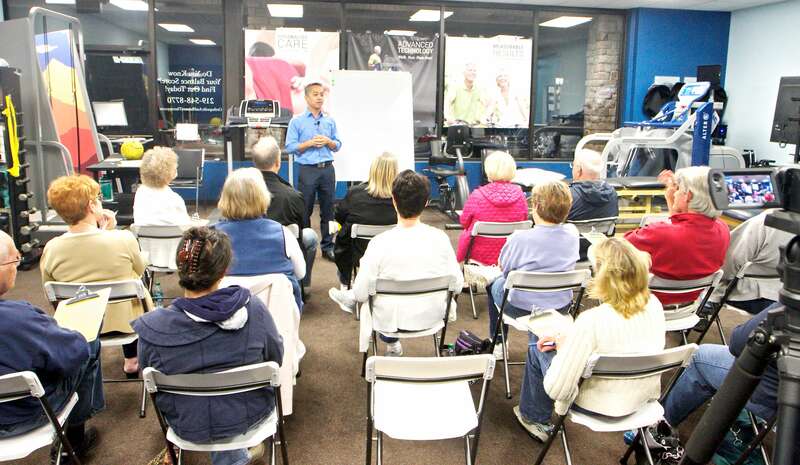 Dr. Alburo presents workshops on Back Pain and Sciatica, Rotator Cuff Tears and Shoulder Pain, Balance and Dizziness, Heel and Foot Pain, Neck Pain and Headaches, and Knee Pain. He has spoken at national conferences in San Diego and Orlando. He is married to his wife Jane of 21 years, and they have 2 children, their daughter Alex (a high school senior), and their son AJ (a freshman). They live in Valparaiso.